Launching and maintaining a private therapy practice can be a bit overwhelming. There are many ways to market your practice, and different things work for different practices, so sometimes you may feel like you are spinning around doing a lot of different things and are not sure what actually works. Today, we want to give you a brief overview to the broad steps to marketing your private practice. There are different ways to accomplish each of these steps (both offline and online), but each is integral to building a thriving and profitable private practice. · Create a message: Put what you do into words that both your colleagues and potential clients can understand. · Create a path: Make it clear what you want your potential client or colleague to do. Invite them to take an easy, next step that benefits them like chatting on the phone, watching an amazing video, etc. · Focus on relationships: Most people won't connect on the first view or contact (both colleagues and potential clients). Find a way to connect initially, stay in touch, and build relationships. · Get your message out: About 1-2% of people who see a GREAT message will respond. That means you need about 100 people to hear or see your message before you will get 1 contact. Want 10 calls per week? Do the math. · Track it: Whether it is a post-it note or Google Analytics, have a way to track what is working and what isn't. · Tweak it: Tweak your message until you are getting 1-2% of people responding to your message. You have to track it to tweak it! · Get paid: If you get phone calls but don't know how to schedule at your stated fee, you will be spinning your wheels. Develop an effective process for initial phone calls. · Create change: If you schedule but aren't effective in your therapy work- even if it is because your client isn't doing the work- learn how to create change in your clients, or weed out people who aren't ready for change. We want to know- what steps are you focusing on this week? What are your questions? Post them below! Are you a visual person? We commissioned an infographic on Fivver.com and they converted this list into a little cheat sheet you can download, print, or share online. Can you see how this might help you get your message out into the world? Think for a second about the people in the psychology and psychotherapy field that you most admire. The pioneers, the groundbreakers, the transformers... what do they all have in common? They all have a clear mission to transform people's live using therapy. During my first semester of my Master's in counseling psychology I started working at a domestic violence center. I didn't realize at the time how this position, would in some ways, have more of an impact on my future clinical practice than my graduate degree. Immediately, I received 70 hours of intensive trauma training. They trained me to start implementing what I learned immediately doing face to face work with domestic violence and sexual assault victims as a paraprofessional. As I completed coursework, this initial training gave me a unique lens with which to view and apply the material. And, when I asked a professor how the couple's research we were reading applied to domestic violence cases- she said "you won't see much of that," I began to see the great divide between people doing the day to day work, and those doing the research. The people who are changing the world are the ones who are delving deep into their work with real clients. Therapists just like you are changing the world. Marsha Linehan started out as a clinician in 1974, working in a variety of settings- including with homeless women. She didn't start out as the developer of the gold standard for treating Borderline Personality Disorder. She started out as someone, just like you, who was looking to deeply help people. Even before that, she started out as a person who was hurting herself and trying to find a way out of her own pain. She had been treated by well meaning medical professionals whose treatments didn't work, subjected to years of seclusion, electroshock therapy, and psychoanalysis which did not develop the skills she needed to survive successfully. She had to stumble through the process of healing on her own, and heal she did. What takes therapist from good to great? Marsha was deeply passionate about helping people who were in the most intense pain, people who others weren't sure how to help. So she committed herself to developing processes and strategies that really worked for a specific population. She decided who she most wanted to heal, and made herself an expert in the field. I don't think it was about marketing, or ego, or money. It was about wanting to do something great in the world, wanting to help people who desperately needed someone who was willing to do what it took to find a process that worked. You can't be awesome at everything. Therapists need a wide variety of skills. We need to be a jack of all trades. We need to be able to understand, diagnose, and treat every issue under the sun. Our clients don't often present as cookie cutter representations of DSM diagnoses. And yet, can we be awesome at everything? Can we keep up on the advanced training it would take to delve into the cutting edge research in treating each and every issue clients are presented with? What if you choose one thing to be awesome at? I talk to therapists daily who are tired and burned out. They often won't even realize that is how they feel. They might share that they are unsure, a bit confused, a bit uninspired. I take them through a process to tap into their passion, and develop a plan to reach out and help the people they are most inspired to heal. During this process, I feel honored to hear the way voices change, giggles emerge, tears fall as therapists connect back in with the real reason they do this work- to deeply transform people's lives. What would be different if you specialized? How would that change the trainings you took? How would that change the books you read? How would that change the trainings you gave to your community? The supervisor or consultants you work with? The clients you referred out? The way clients see you? The way your colleagues view you? How would it change the way you viewed yourself? Would this impact your clinical outcomes? Would you get better at working with a specific population more quickly? Would your clients get a more inspired, excited therapist? If you try to speak to everybody you speak to nobody. Therapists: Be a jack of all trades but truly, deeply, master one. Continue to be a great generalist. Know all of the variable issues that your clients can bring in the door. However, allow yourself to be truly great, truly outstanding in one particular area. Allow the world to know about it. Allow yourself to explore it deeply. You never know, you might be the next clinician to make an advance in the profession that changes the lives of people around the world. Be the next Gottman, be the next Sue Johnson, be the next Francine Shapiro. While each of these people have degrees, research, and a body of work- all of that didn't just happen by accident. They chose their path. They chose to allow themselves to fulfill a deep passion and purpose in one particular area and to become great. Have you chosen your path? Share below the path you have chosen to becoming outstanding, awesome, and change the world. Disagree? Let's hear about it! Intensive stuff: Business School Bootcamp for Therapists. 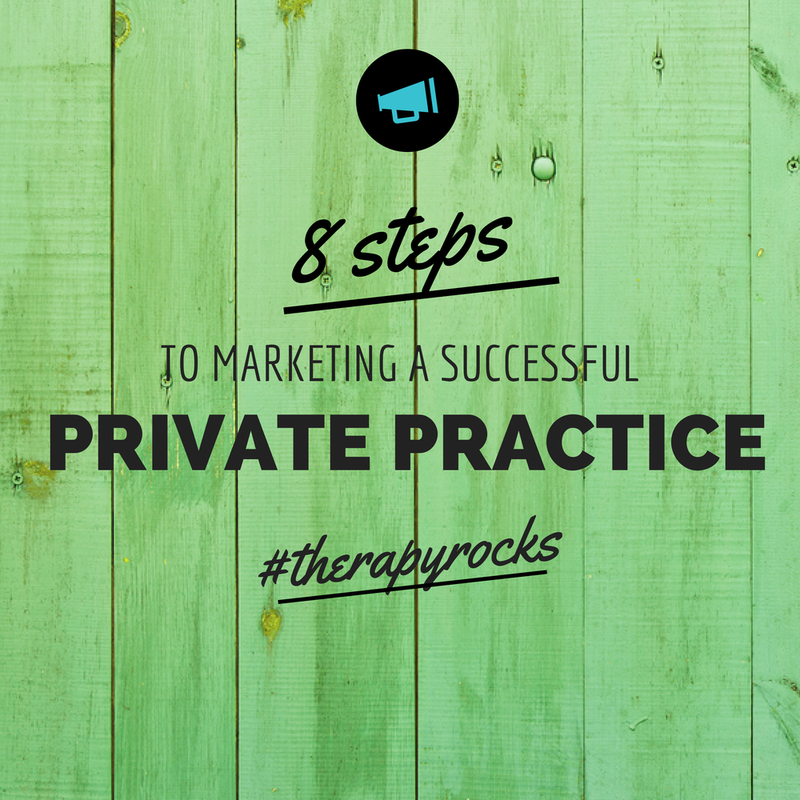 Launching and maintaining a therapy private practice can be a bit overwhelming. There are many ways to market your practice, and different things work for different practices. So, some times you may feel like you are spinning around doing a lot of different things and not sure what actually works. Today, we want to give you a brief overview to the broad steps to marketing your private practice. There are different ways to accomplish each of these steps (both offline and online)- but each is integral to building a thriving, and profitable private practice. Create a message. Put what you do into words that both your colleagues and potential clients can understand. Create a path. Make it clear what you want your potential client or colleague to do. Invite them to take an easy, next step that benefits them like chatting on the phone, watching an amazing video, etc. Focus on relationships. Most people won't connect on the first view or contact (both colleagues and potential clients). Find a way to connect initially, stay in touch, and build relationships. Get your message out. About 1-2% of people who see a GREAT message will respond. That means you need about 100 people to hear or see your message before you will get 1 contact. Want 10 calls per week? Do the math. Track it. Whether it is a post-it note, or Google Analytics, have a way to track what is working and what isn't. Tweak it. Tweak your message until you are getting 1-2% of people responding to your message. You have to track it to tweak it! Get paid. If you get phone calls but don't know how to schedule at your stated fee, you will be spinning your wheels. Develop an effective process for initial phone calls. Create change. If you schedule but aren't effective in your therapy work- even if it is because your client isn't doing the work. Learn how to create change in your clients, or weed out people who aren't ready for change. Do you ever wish there was a guide just for you? Do you want some hand-holding through implementing each and every one of these steps? Someone to look at what you've written and give you expert feedback? Someone to look at your website and give you tangible feedback of what to tweak to make it more inviting? Someone to help you get confident about the financial planning of your business and get clear about how to reach your financial goals? We do all this and more in our lifetime access Business School Bootcamp for Therapists. Click here to learn more and set-up a free interview today with Kelly or Miranda.